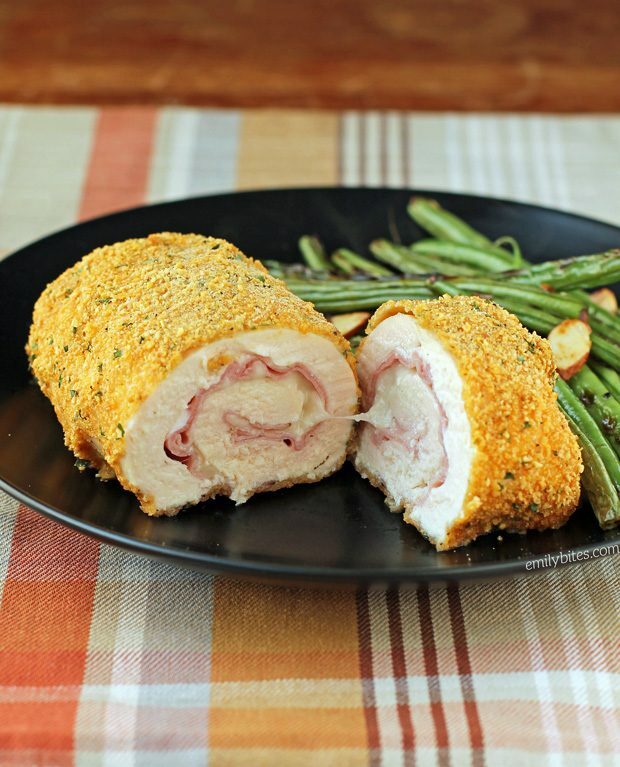 Chicken Cordon Bleu may sound a little fancy, but it’s actually really simple to make. You just pound out chicken breasts, roll them up with ham and Swiss cheese and then give them a crunchy bread crumb coating before baking. Easy, right? I decided to change it up a little bit and use corn flake crumbs because I think the flavor goes really well with ham and cheese. I also sometimes eat this with a little mustard on the side for dipping – it pairs really well! 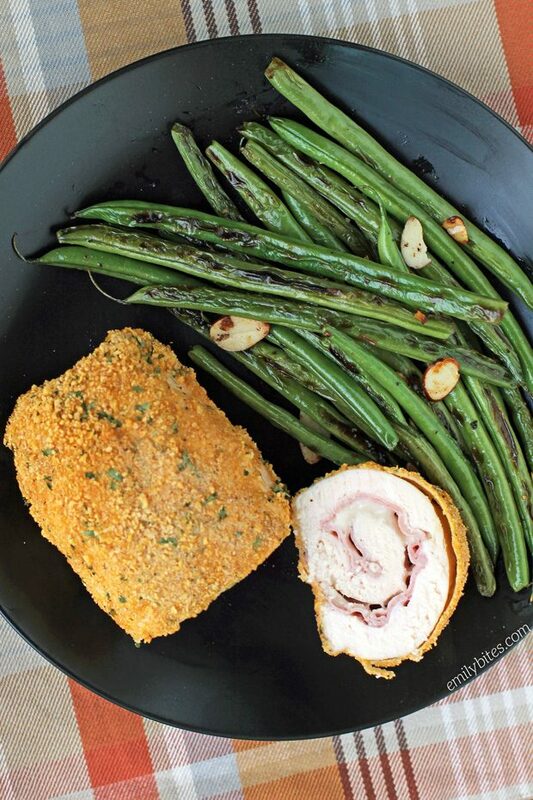 This Chicken Cordon Bleu is perfect served with roasted vegetables, sautéed green beans or salad. 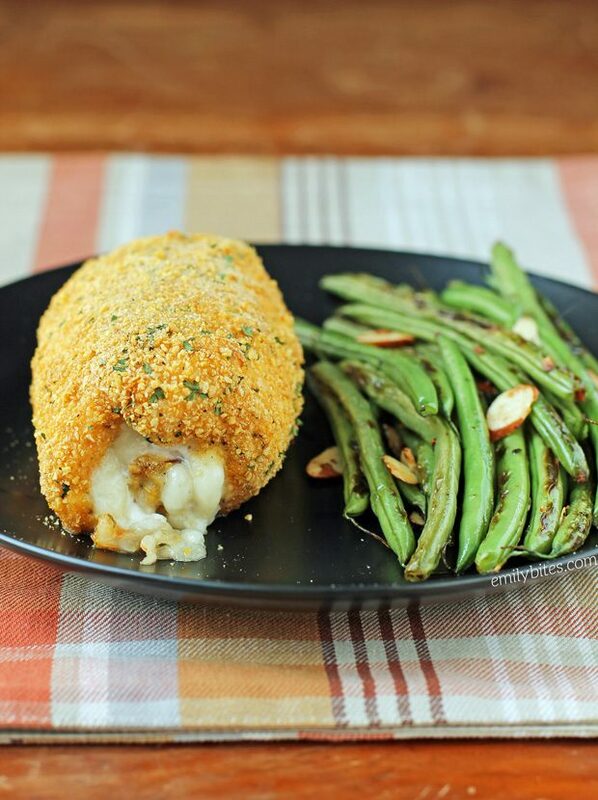 Each piece of chicken is large and filling and just 369 calories or 5 Weight Watchers SmartPoints! Looking for more ways to jazz up your chicken breasts? Try my Pimento Cheese Stuffed Chicken, Cream Cheese Stuffed Everything Chicken, Antipasto Chicken Roulades, Cheddar Ranch Chicken Tenders, Cheesy Bacon BBQ Chicken, Pesto Chicken Roulades, Lemon Pepper Iced Tea Chicken, Cheesy Chicken and Stuffing, Pizza Chicken Roulades, Thai Chicken Skewers, Chicken Piccata, Slow Cooker Buffalo Chicken and many, many more in the chicken section of my recipe index! Pre-heat the oven to 375. Line a baking sheet with parchment paper or foil and set aside. Place the chicken breasts on a cutting board. Using a meat mallet, pound the breasts to a ¼ inch thickness. Lay one ounce of ham across the surface of each breast and top with ¾ ounce of Swiss cheese. Starting with a short side, roll each breast up and seal the edges shut using a few toothpicks. Place the rolled and sealed breasts in a Ziploc bag and add the flour (you may want to do this in two separate batches). Lightly flip the bag around until chicken is coated. Place the beaten egg whites in a shallow dish. In a second shallow dish, mix the bread crumbs, salt, pepper, parsley, onion powder and cayenne until well combined. Remove each rolled breast from the flour bag and dip it in the egg whites, turning to coat. Then move the coated breast to the breadcrumb dish and coat it with crumbs on all sides. Place the completed rolls seam side down on the prepared baking sheet. Lightly mist the tops of the breaded breasts with olive oil cooking spray. Bake for 30 minutes until chicken is cooked through. Don’t forget to remove the toothpicks before serving! Simple and good, all the protein was especially satiating. I served with roasted veggies and a side salad and felt nice and full. Also, a big thank you for calculating both PP and SP. I’m happier on the old plan and so appreciate that you include PP. My sister on the other hand likes the new SP plan so we can both share and refer to your recipes. You are seriously a lifesaver for me on this weight loss journey! OMG this was so good . Will be on the menu alot . Easy to make thanks for sharing this recipe.